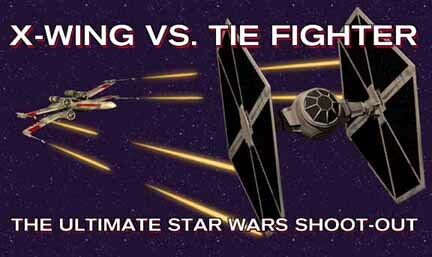 One of the most popular and the most entertaining space combat simulators is the LuasArts’ X-Wing and TIE Fighter series of games. In almost every aspect this software shines, and by the way can be found even today on the shelves of video game stores in the personage of Star Wars TIE Fighter Collector’s CD-ROM from LucasArts. The multiplayer version of these two immensely popular Space flight combat simulators will finally give space fighter jocks the chance to fly in cooperative or competitive mode over an 8 player network. Take control of one ship or a squadron of ships and fly 15 missions designed specifically to force pilots to work together for success. The simulator will feature new three dimensional maps and high detailed texture-mapped ships. Plot: none, nor is their a campaign structure, there is a string of nonlinear missions with the Battle of Endor as the setting for these missions. Ships: For the Alliance you can fly A-Wings, B-Wings, X-Wings, Y-Wings, and Z-95. For the Empire you will fly and like it the TIE-Fighter, TIE-Interceptor, TIE-Bomber, TIE Advanced, and the Gunboat. Graphics: New texture mapping for enhanced details. Animation: The only black spot on an exceptional game is that even a Pentium 200 does not handle the frame rate with the high resolution missions. And while you can play the game on lower resolutions allowing access to those with less powerful platforms. You may have to buy a Pentium II 266 MHz machine to play this one with decent frame rate at high resolution. Music: The music is from the actual John Williams' movie sountracks in true redbook audio. The music has a profound effect on the game play and the enjoyment of the game. The soundtrack brings back those days when you were sitting on the edge of the seat in a movie theater watching the original movie. Sound effects: The sound effects, just like the music, are also from the movies. The whine of the Tie Fighter as it passes near the X-Wing has unbelievable ability to transport you right back into the movie. The sound effects and music have also been a very strong feature of all Lucas products, and especially the Star Wars games and movies. Multi-player: This game was designed as a multiplayer game. One of the nice features is that you can take part in actual missions from the game in the team battles. You can fly for either side. This ability to share in the scripted missions has been a long time coming for an intelligent industry. It is probably the best feature of the game. It combines the drama of playing scripted missions with the multiplayer aspects we like so much. Now, for the first time, you can really play the games you like with your friends and family. All games should have this feature role playing adventures, flight simulators, etc.--not just Doom. Christine Grech Wendin, PC Games, volume 3, number 8, August, 1996, pg. 35-36. Wayne Cline, The Adventurer, number 12, summer, 1996, pg.5. T. Nguyen, Computer Gaming World, number 146, September, 1996, pg. 40.